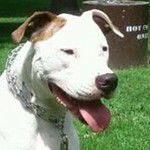 Dozer is about 2 years old, healthy & neutered. He weighs 87 lbs. He walks beautifully on a leash and responds to commands. He’s housebroken and appears friendly with other dogs and has successfully played with a family member’s dog. 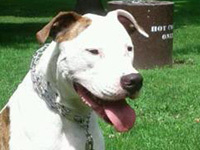 Dozer was found as a hungry stray in the Yorkville area. 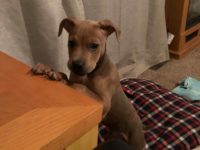 He charmed his way into the home of a wonderful family, but unfortunately, their landlord won’t allow them to keep him very long. They would if they could; they adore him, and vice versa. He’s clearly been loved and well trained. He’s just had his vaccines and been checked out by the vet. He’s in excellent health. He likes the water! He has gone for several impromptu swims. If you like water sports and are looking for a dog to share your enthusiasm, he’s the one. To learn more about Dozer, contact Sarah at 630-540-6810 or Julie 847-219-5673.